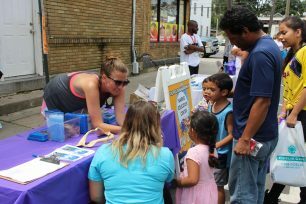 (August 28, 2017) Nearly 300 residents of Mamaroneck and other Sound Shore communities participated in a day of health awareness at the 4th Annual Access to Care Health Fair, held Saturday, August 12 in Mamaroneck. Adults took advantage of free health screenings and informational exhibits while children and their families enjoyed Zumba demonstrations, music by D.J. Theo Philip, a bounce castle, and healthy snacks. 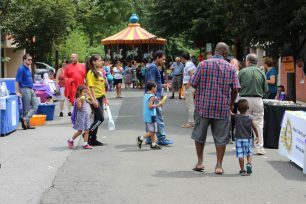 The fair was organized by the Healthier Mamaroneck committee, a community coalition that brings together local leaders, health and social service providers, and residents to respond to the needs to low-income families and individuals living in Mamaroneck. For the first time, the event took place outside, on Sheldrake Place, which was closed for the day. Several health screenings were also offered at Open Door Family Medical Centers’ new facility, located at 689 Mamaroneck Avenue. 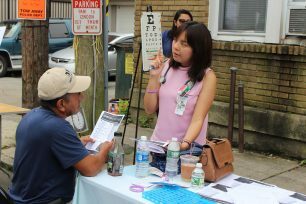 Residents who stopped by the fair found representatives of more than 20 health and social service agencies, many with bilingual staff ready to conduct screenings and answer questions. By mid-afternoon when the fair ended, over 300 screenings and exams were conducted; the most popular were blood pressure checks, glucose screenings, and dental assessments. In addition to services offered on the street and in Open Door’s facility, participants visited Open Door’s dental van and Planned Parenthood’s medical van for rapid HIV testing. New York Life provided child identification cards for all children. People who were found to have health concerns or risks were referred for follow-up care. 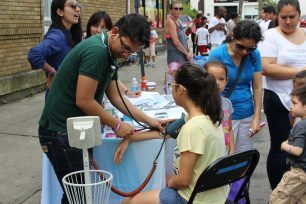 Major sponsors of the Health Fair included: the Rye YMCA, Community Resource Center, Open Door Family Medical Centers, Montefiore/New Rochelle, Affinity Health Plan, and Greenwich Hospital. 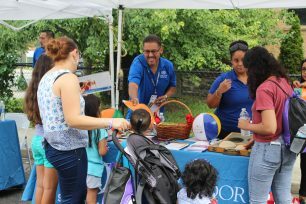 Nearly 300 residents of Mamaroneck and other Sound Shore communities participated in a day of health awareness at the 4th Annual Access to Care Health Fair, held Saturday, August 12 in Mamaroneck. Adults took advantage of free health screenings and informational exhibits while children and their families enjoyed Zumba demonstrations, music by D.J. Theo Philip, a bounce castle, and healthy snacks.